This page describes blue-eyed cats in colours other than white, bicolour or colourpoint (Siamese pattern). Some of the Russian breeds have variable spelling when the breedname or cat name is translated into the Roman alphabet. This information will be updated as more of the gene's effects become apparent. There is currently no DNA test for the gene(s) involved. Blue-eyed non-white cats were discovered almost 20 years apart and on almost diametrically opposite regionss of the globe: the California Ojos Azules and the Kazakhstan Altay Blue-Eyes. In both cases, outcrossing showed that the blue-eyed genes were dominant type over the ordinary yellow, copper or green colours. In both cases there is at least a tiny white marking, most often at the tail-tip, but it might also be a white locket, white back paws or a white smudge on the face. Due to incomplete penetrance of the gene, the size of the white marking ranges from just a few hairs to a large white patch (in homozygotes). It is currently assumed - though not proven by DNA analysis - that the Altai blue-eyes gene is an allele of the white spotting gene and that it is “weakest” in comparison to the usual white spotting gene which causes the familiar bicolour range and it may also interact with the white spotting gene. Genes encode for proteins and any change to a protein can have other effects. Olga Volynska was the first to notice blue-eyed cats at a factory, but her report was largely ignored because conventional wisdom said blue-eyed colour cats could not exist. A couple of years later the Ojos Azules was reported in a TICA journal. Lyubov Borisovna Zikeeva from Ust-Kamenogorsk noticed the blue-eyed cats on the street, and decided to find out more. The first Ust-Kamenogorsk Altai was an ordinary domestic semi-long-haired cat, with white marks, with the right eye blue, and the left eye yellow-green. If the Ojos Azules could be recognised as a new breed on the basis of eye colour and small white marked, then the Altay could be recognised too! The cat magazine "Friend" (issue No. 8/9 August-September 2004) reported that the first owner of an Altai cat was Vera Sokolova, who lived in the city of Ust-Kamenogorsk in Kazakhstan. In 1995 she owned a black cat called Fyodor who had blue eyes and a white tail-tip, a phenotype that resembled the American Ojos Azules discovered in California. Lyubov Borisovna Zikeeva began talking with Fyodor's owner, and from him she embarked on the creation of the Altay blue-eyed breed which has lasted more than twenty years and continues today. After many unsuccessful matings, Zikeeva L.B. was finally rewarded by the birth of a blue-eyed cat named Ariel, which is considered the progenitor of all living Altai cats. After breeding a blue-eyed kitten, Zikeeva mated blue-eyed to blue-eyed to get a wholly blue-eyed litter. This is when she discovered that homozygotes were deaf. Kittens with one eye blue and the other green-yellow are heterozygotes (the gene is dominant with incomplete penetrance) and from the point of view of deafness should be used in breeding, while homozygotes with two blue eyes should not. Line-breeding for generations is used to fix the traits, but in the third generation an outcross to green-eyed European Shorthair is needed to prevent inbreeding depression. Early Altai cats bred by Zikeeva L.B. include Roxy/Roksi (tabby with white hind feet and white throat); Grand Yegan (tabby, white cheeks and chin); Ekatarina (tabby with white hind feet and white throat); Nils (tabby, white paws, muzzle and throat). A blue-eyed Altai bred by Lubov Borisovna is Ellie Darling (black tuxedo pattern). By 2016, there were still not a lot of breeders working with the Altai. One of them is an experienced breeder and veterinarian Elena Lobasova (Murmansk, Russian Federation), the other is Anna Kalinichenko (Zaporozhye, Ukraine). “Wonderful Aquarmarine” cattery, (Grin L.V. and Kalinichenko A.O., Ukraine), began breeding Altay (Altai) cats in 2016 under the framework of the WCF registering body. Wonderful Aquamarine studs in 2017 were Efimenty Veles Darlin (silver spotted tabby with blue and green odd eyes) and Sonny Sweet Dreams of Wonderful Aquamarine (blue-eyed red). A queen shown on the website is Missy Nikital (blue-eyed classic tabby tuxedo pattern). It is undesirable to cross two blue-eyed or odd-eyed Altay cats as this can lead to deaf cats with a high degree of white in the coat. Blue-eyed Altay should be bred to non-blue-eyed Altay variants, preferably to green-eyed variants. This produces strong and healthy offspring and a mix of blue-eyed, odd-eyed and green-eyed offspring. 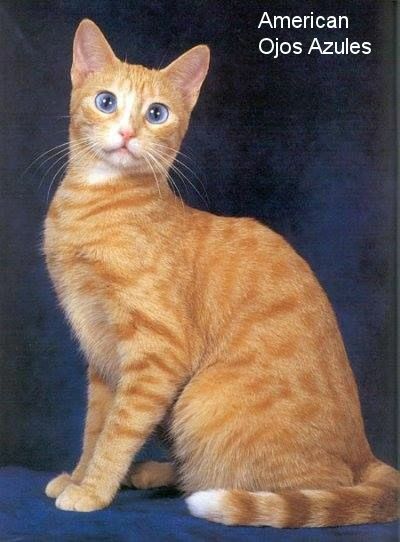 Unlike the American Ojos Azules, Altay cats do not have gross physical deformations associated with the mutation. Along with the Ukrainian Topaz breed they are mistakenly called “Russian Ojos Azules” by English speakers. Altay Blue-Eyed were used early on with Topaz which combines two different lines of blue-eyed cats, but which differs in white marking pattern and sometimes having black-roan fur. In the Altai, the bright blue eyes, or odd eyes, can be combined with non-white cats. The breed code is ALT and it is recorded in the register of new breeds and cat colours by the Tribunal Commission of the SFF in 1999. In that year, a draft standard was created and registered for the Altai Blue-Eyed (also known as ABE for short). This old standard called for a rounded wedge shaped head, cheeks not very pronounced, straight nose, the transition to the forehead being smooth without indentation (the 2018 standard calls for a distinct stop), strong jaws and rounded chin. Eyes are round and medium sized, set slightly obliquely and are blue or odd-eyed. Ears are small with slightly rounded tips, slightly taller than they are wide at the base (the 2018 standard calls for large ears, very wide at the base). Body is rectangular, medium sized, strong, flexible and muscular. Legs are medium length, and paws are round. The colours are solids, tabbies or torties with or without white, and there is a distinctive white tail-tip which may extend to one-third the length of the tail. Blue-eyed Altai without any white are the most prized. Fur is short, dense, glossy and springy with a well-developed undercoat. The experimental breed has been exhibited in non-competition classes or as household pets. Breeders considered this unfair because some Altai pedigrees now have 5 or 6 generations of Altai-to-Altai breeding and are maintained and registered, whereas household pets can be mongrels. A WCF standard for the Altai was drawn up in 2018 (Anna Kalinichenko) to promote the Altai as a distinct breed and differentiate it from the Ukrainian Topaz and Celestial British. It calls for a medium to large, muscular and sturdy cat with a dense coat, vivid blue eyes and non-pointed colours. Its vivid blue eyes are wide-set, oval and slightly tilted - their outer corners being above the level of the outer base of the ears. The eye-colour should be rich, vivid and uniform blue, blue-green or green, or odd-eyed with good contrast between the two eye colours. Any eye colour is permitted, but blue and green colours are preferred for exhibition-quality cats. Strabismus (crossed eyes) is a disqualifying fault. The head is round (a modified wedge with the width being almost equal to the length), the muzzle is fairly short, the chin is firm, the whisker-pads and cheekbones are pronounced. The ears are large, very wide at the bases and low-set with tufted tips and ear furnishings. The forehead is rounded and the profile has a distinct stop. The neck is long, strong and muscular and proportionate to the head and body. The body is medium length, strongly boned and compact with a broad chest. Males are larger than females. Limbs are strong, medium-long and slender (not cobby) with the hind-legs being slightly longer than the forelegs. 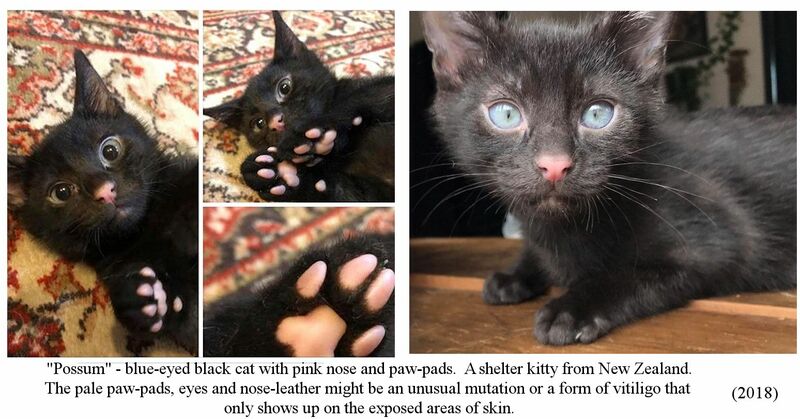 The paws are oval; polydactyly is not permitted. The tail is medium length (long tails are also permitted, but not short, kinked or bobbed tails) and well-furred. The fur is especially thick on the back, legs, muzzle, cheeks and ears, sides, and tail, and there must be no signs of baldness. The coat can be short or semi-long. All colours are allowed, including bicolour, although cats with as little white as possible are preferred. Solid white and colourpoint are not permitted. Until 2030 it will be allowable to out-cross Altai cats with American and European Shorthair, British Shorthair, Bengal, Abyssinian, Somali, and Siberian to produce the correct conformation, but after May 1, 2030, out-crossing will be prohibited and only Altai-to-Altai matings will be allowed. However, breeding together two blue-eyed or odd-eyed Altai cats is not permitted because it may lead to deafness and white coats in cats homozygous for this dominant gene. Regarding deafness, the Altai gene has similar risks to “blue-eyed white” and “blue-eyed high-white bicolour” because the absence of melanocytes affects inner ear development as well as eye colour. 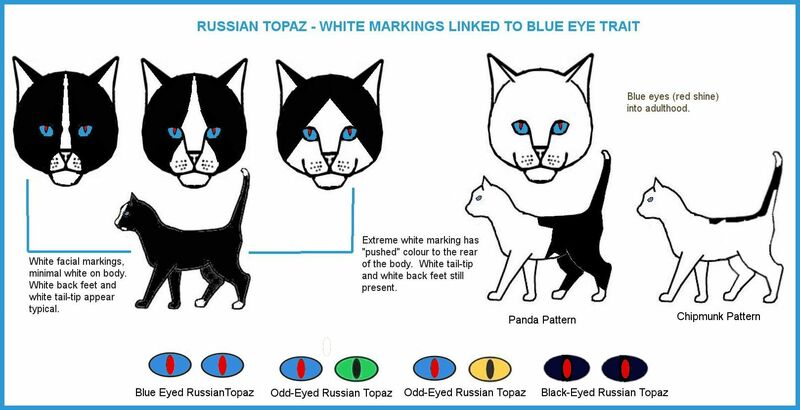 Blue/odd-eyed Altai may only be bred to non-blue-eyed Altai (preferably green-eyed) which will produce litters with a mix of blue-eyes, odd-eyes and green-eyes. Altai cats are friendly and adapt well to their environment. They are active, energetic, sociable and affectionate and take an interest in everything going on around them. They do not require excessive space and they get on well with other animals. No special care or attention is required beyond the normal care of a short-haired cat. 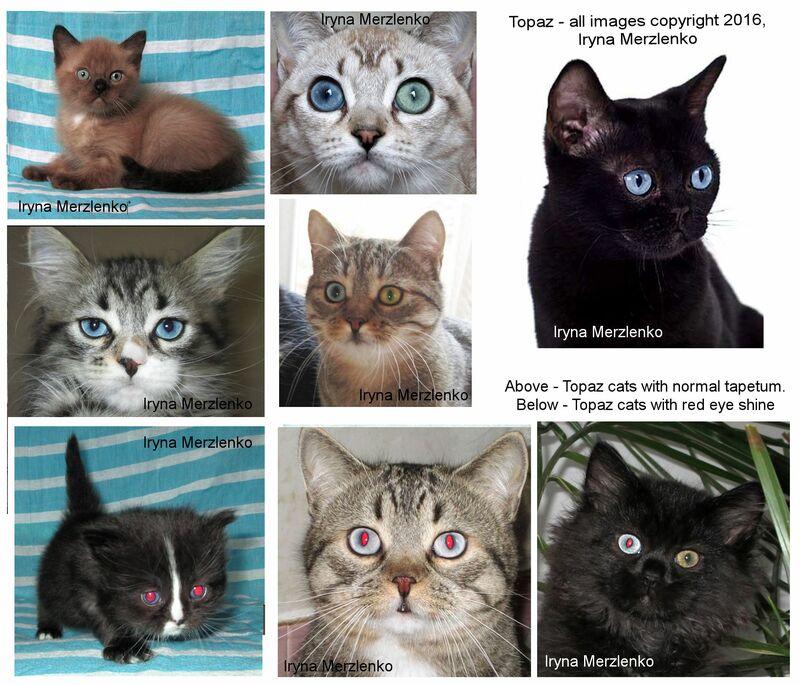 The Topaz is being developed by Iryna Merzlenko in Nikital cattery in Ukraine starting in 2016. It is the Asian equivalent of the Ojos Azules and is also mistakenly known as the Russian Ojos Azules. It is not related to the American Ojos Azules. The first cat came from Kazakhstan (Eastern Altai) and is the Altai Goluboglazaya breed (Altai Blue Eyes - dominant gene with incomplete penetrance i.e. some cats can have the gene but not display it). The second cat came from Russia, 3,000 km from the first cat and was dubbed the Russian Ojos Azules (Russian Blue Eyes) because it resembled the American breed (which was never exported from the USA). Whether it is a mutation of the same gene as the unrelated American cats can only be found out by genetic testing. Unlike the American breed, the Russian cats do not appear to have gross physical deformities associated with the mutation, however most homozygotes are deaf. The preliminary standard for the Topaz calls for a small or medium-size, compact cat. They are not high on paws. The tail is straight, round and thick. The head is medium sized and rounded, with a well-developed chin and good jaw (no more than 2mm undershot). The ears are small or medium size, broad at the base; the tips may have a small brush. The Shorthair Topaz has a short, glossy, close-lying coat and almost no undercoat. The Longhair Topaz has a long outer coat and a small amount of undercoat, a very long and fluffy tail, fluffy britches and a small neck frill. To prevent mixing with blue-eyed whites, the coat colour can be anything except pure white or predominantly white. If there is more than 25% white, the tail tip should be a solid dark color. The eyes are large or very large, round, wide open and expressive. The eye colour is the distinguishing feature. Eyes must be blue – either both eyes or odd eyes. The blue ranges from deep, bright blue through to violet blue. Cats with red pupils may be used for breeding. In odd-eye Topaz, the non-blue eye is often a shade of green or yellow-green. In later generations, black-eyed Topazes occurred. These have irides so dark-coloured that they are black. On close inspection, they appear to be a very dark olive green. The Topaz is a playful, affectionate, people-centred cat. Acceptable outcrosses are Bombay (Asian Shorthair), British Shorthair, European Shorthair, Altai Goluboglazaya. Crossing to the Scottish Fold is not permitted. It is not advisable to mate two blue-eyed cats together in case this gene has similar side-effects to the gene found in the unrelated American Ojos Azules. Topazes have been exported to American breeders, the Gobbles, who intended to register them as Ojos Azules even though the gene is different. 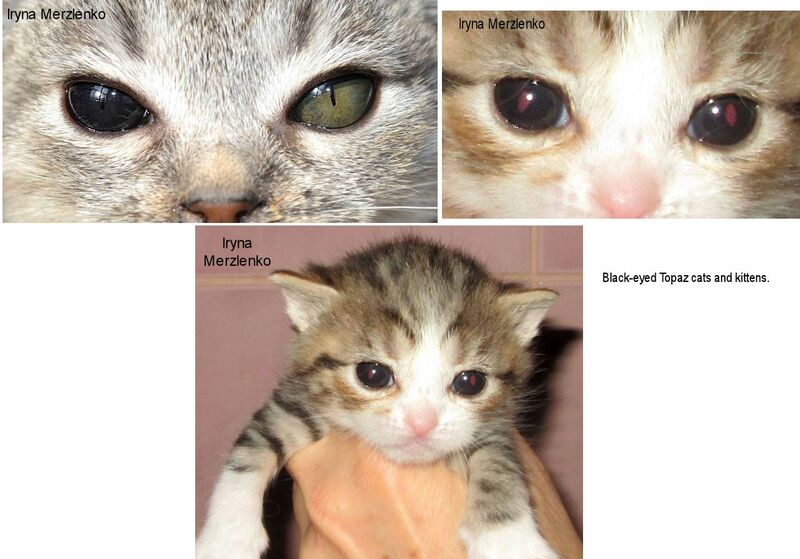 Having obtained the Topaz cats for breeding in the USA, contact with the breeder was blocked. Cats have also been exported to France (Nikital line) and Germany to found new varieties there. According to Iryna, the percentage of deformities and stillbirths is about the same as in any other breeds of cats. In the case of homozygotes which have a high degree of white, the only drawback is deafness, but even in this case not all high-white Topaz cats have this. Iryna's female Christina, which has the same "white shirt and dark trousers" pattern (dubbed Panda pattern) as Panda, has a normal hearing while Panda does not. A more extreme pattern is "chipmunk" - all white with a short colour stripe along the backbone. The other anomaly is that homozygotes tend to have a shorter nose and sometimes deformation of the nasal mirror (deviation of the nasal septum), but this does not affect breathing or lifestyle. Because the Topaz cats are derived from two distinct blue-eyed populations that occurred 3,000 km apart, there may well be two different genes at play. So far, only one breeder who crossed a Russian blue-eyed cat with another breed in order to introduce the blue-eyed trait, found higher than expected mortality in kittens, but this might be due to factors unrelated to the eye colour gene. One of the blue-eye genes involved also affects coat colour. The colour-and-white-blanket patten (Panda pattern) which looks like a cat wearing a white shirt and coloured trousers is linked to one of the blue eyed genes and to deafness in some of the cats. These cats can also change from black to silver grey or black-roan in a manner resembling the karpati pattern. Cats with vivid blue eyes were discovered in New Mexico among feral cat populations in the 1980s. In 1984, a blue-eyed tortoiseshell named “Cornflower” was bred to non-blue-eyed males resulting in litters of blue-eyed kittens. This showed the trait to be dominant. The breed was named “Ojos Azules,” this being Spanish for 'Blue Eyes'. Unlike the blue eyes seen in white cats, some bicolours and colourpointed cats, the Ojos Azules gene was not linked to a particular fur colour or pattern. It also produced a deeper shade of blue than in colourpointed cats. It was also not associated with squinting or crossed eyes (seen in some colourpointed cats) or with deafness (seen in some blue-eyed white cats). 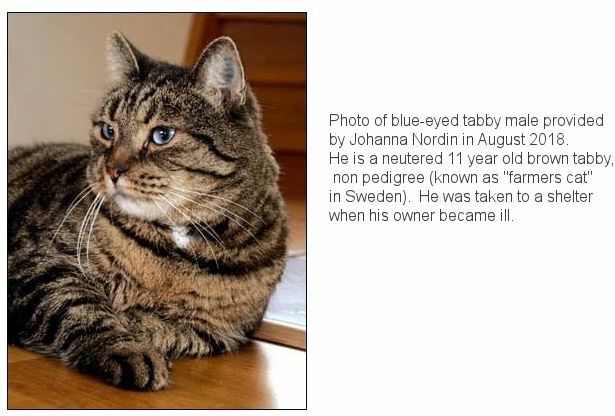 Breeders saw this as an opportunity to breed blue-eyed tabbies, blue-eyed solid black cats etc. One indicator of the presence of the Ojos Azules gene was a flattened tail-tip. Unfortunately, the gene was also linked to birth defects; kittens inheriting two copies of the gene being deformed or stillborn. It wasn’t clear if the deformities were caused by the Ojos Azules mutation itself or by an adjacent or linked gene. Solveig Pflueger investigated these issues and small-scale breeding then resumed in the hope of breeding Ojos Azules without the lethal genetic defects. When the Ojos Azules gene is homozygous it results in cranial deformities, white fur, a small curled tail, and stillbirth. When the gene is heterozygous, these lethal genetic mutations do not occur. This means it is undesirable to mate two blue-eyed Ojos Azules together. The deformities can be avoided by breeding a blue-eyed cat with a non-blue-eyed cat. This produces a litter with approximately 50% blue-eyed kittens and 50% non-blue-eyed kittens. The blue colour is described as having depth (hue) greater than that seen in a Siamese. Regardless of the causal mutation, blue eye colour in cats is due to the absence of melanin in the iris The depth of colour is due to polygenetic variations and many show cats (Siamese, blue-eyed whites) have equally deep blue eyes. The contrast of blue eyes against a dark or patterend coat is the main attraction. The breed was accepted for registration by TICA in 1991 in both long-haired and short-haired varieties. By 1992, only ten Ojos Azules were registered. The breed standard was last updated in 2004. Only those cats with deep blue eyes are termed the Ojos Azules, the other cats in the breeding programme are “variants” and are important for the health of the breed. The standard says “Eye colour should be clear blue or blue-grey, not turquoise or lavender. In odd-eyes, the second eye may be gold, copper, or green. A deeper eye color is preferred. The Ojos Azules is medium-sized with large, round blue eyes. The neck is arched. The tail is proportionate to the cat's body. The head is somewhat triangular in shape with a slightly rounded forehead, an angular muzzle and a slight nose break. The coat is short, fine, soft, silky, and shiny without too much undercoat. All colours are allowed and white markings on the extremities (tail-tip, hind paws, and muzzle) are common, as is a sprinkling of white hairs. Because the eye colour is due to lack of melanin pigment, white markings elsewhere may be inevitable. Particolours must have a white tail tip as this is an indicator of the Ojos Azules gene, however a white locket on the chest or white spot on the belly are considered faults. Solid white is not desirable because it is visually the same as existing blue-eyed white cats. The cats bred were active, friendly, and affectionate. Nicole Ehrenboth, Hannover, Germany breeds the German Longhair (DLH – Deutsche Langhaar) and in collaboration with Miriam Volk and Anette Lanetzki has introduced the Altai blue-eyed gene into the German Longhair. In August 2016, the LOOF (French registry) Committee of Standards approved the introduction of the blue eye colour in the British Shorthair by Chatterie d’Aerlin (Sophie Guittonneau) and Chatterie de la Grace (Stephanie Jimenez). In 2017, the partipating breeders included Lazycat Compagni (Vanessa Marmolejo), Vivarnon Cattery (Ghislaine Michel-Paulsen) and Chatterie les Gummis en Sucre (Sylvie Huber). The blue-eyed cats used were considered European Shorthairs and the progeny of the matings to British Shorthair/Longhair cats were registered as XSLH or XLH (experimental SH/LH). All the blue eyed kittens born at Aerlin cattery are tested with BAER for hearing because deafness has been observed in some of the homozygotes. No deaf cats are used in further breeding. In October 2015, the black smoke Altai “Lagoon” died of pneumonia before joining Chatterie d’Aerlin from Ukraine so her black smoke sister, “Kaena” was sent instead. 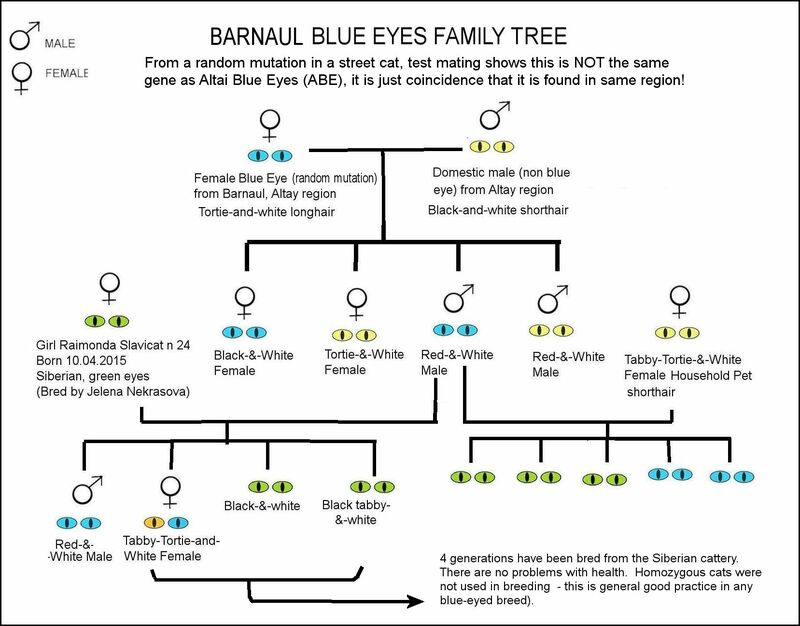 Kaena was not blue-eyed (light green eyes) but carried the incompletely dominant gene and would produce blue-eyed kittens when mated to “Lazuli” from the same breeder in Ukraine. Kaena expressed the Altai blue-eye gene in a minimal way - a white locket, white belly spot, some white whiskers and the light green eyes. Kaena’s sire had blue eyes. Lazuli was a brown mackerel tabby, with one green eye and one blue eye, from a blue-eyed sire. He carries longhair and is negative for the white spotting gene. January 2016 - Lazuli x Igritte (cinnamon tortie BSH) produced 6 kitten, two of which expressed the Altai gene: Mirage of Aerlin, blue-eyed red self male (genetically mackerel tabby) and Muscari odd-eyed red mackerel tabby long-haired male, longhaired. The other 4 kittens were red males, “Mermite” and Mogwai” (longhaired), “Maya” - black tortie female and “Malice,” long-haired brown tabby female. 18 July 2016: Kaena x Lazuli produced 7 kittens including 2 homozygotes: “Matcha” - black longhair males, not blue-eyed. “Merlin” – black longhair with two blue eyes and white spots on the nose, back legs and tip of the tail. “Mavi” - A female black smoke longhair with a large white marking on the face and two blue eyes. “Mistral” - silver tabby male with white spots on the forehead, legs and tip of the tail, and blue eyes. “Maïdi “ - female brown tabby without white or blue eyes. “Miyuki” - a solid white longhair with a few coloured hairs in the lower back, and blue eyes (homozygote, deaf, not bred from). “Mochi” - bicolour mostly white, with a big colored spot on the lower body and blue eyes (homozygote, not deaf) – this is the pattern known as “panda pattern” in the Topaz breed that was developed from Altai cats. In August 2016 Ilvy Freyja of Preston (copper-eyed black British Longhair female b. October 2010) x Lazuli produced 4 kittens. Matahina of Aerlin (female) was solid black with a small white locket and odd eyes, but sadly died. Maïdee (female) was a black longhair with a white marking on the upper lip and blue eyes - she has gone to David Karamatic in Australia to introduce blue eyes into his solid colour Munchkins. Mauve (female) was a black female shorthair with white lips and chin, and two blue eyes. Monky was a brown spotted tabby shorthair male with non-blue-eyes. Mauve d’Aerlin went to Chatterie de la Grace to continue the breeding programme. In April 2017 Lamu (Tortie BSH) x Muscari produced 3 red kittens, 1 black and 1 chocolate torbie - 4 of which had the coveted blue eyes. 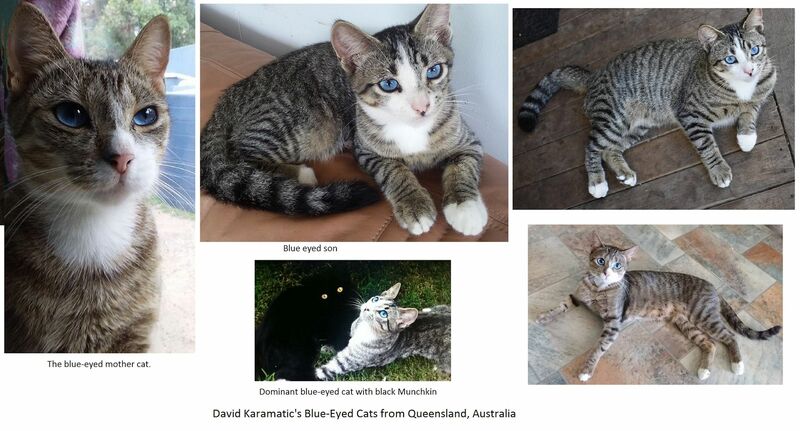 Also in 2017, Ilvy x Muscari produced 2 blue-eyed kittens and one non-blue-eyed. The charts below are from informatin kindly provided by the breeders. Another breeder working with the blue-eye gene is Chloe Alaska (Bordeaux, France) who has Nikital Gioia from Ukraine (bred by Iryna Merzlenko). 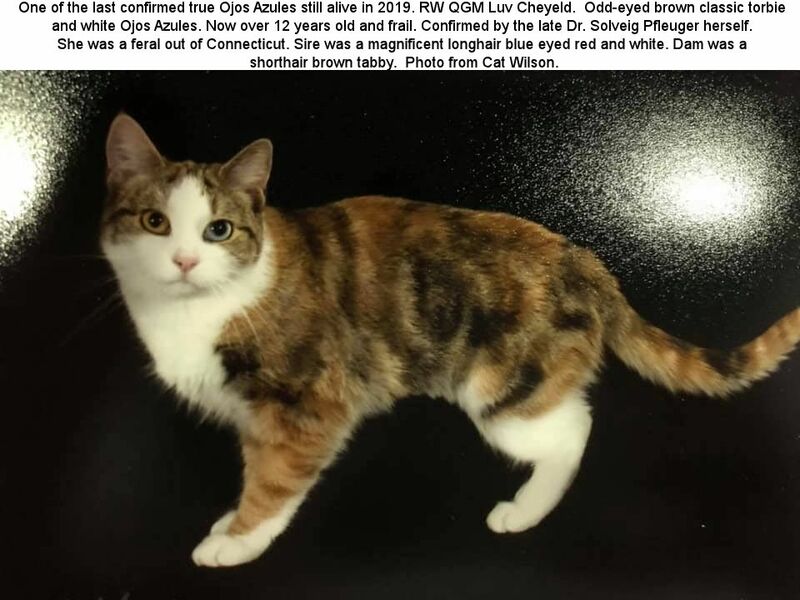 Mated to Ylang Ylang, Chloe’s black Persian stud, Gioia’s first litter comprised 7 kittens, but a black silver tabby female with a node on her tail was stillborn. 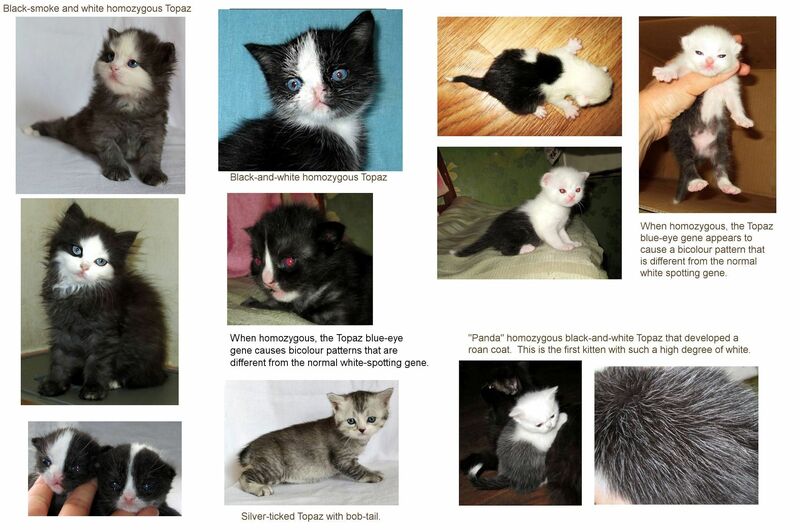 The other 6 were perfectly healthy and included a blue-eyed kitten and 2 odd-eyed kittens. 2 kittens in the litter had a tiny defect on the last vertebra of the tail, but Chloe had previously seen this in unrelated non-blue-eyed) cats. The blue-eyed cats, included Gioia, have had hearing tests and have perfect hearing. Niagara has a tiny white spot under his nose (right side). 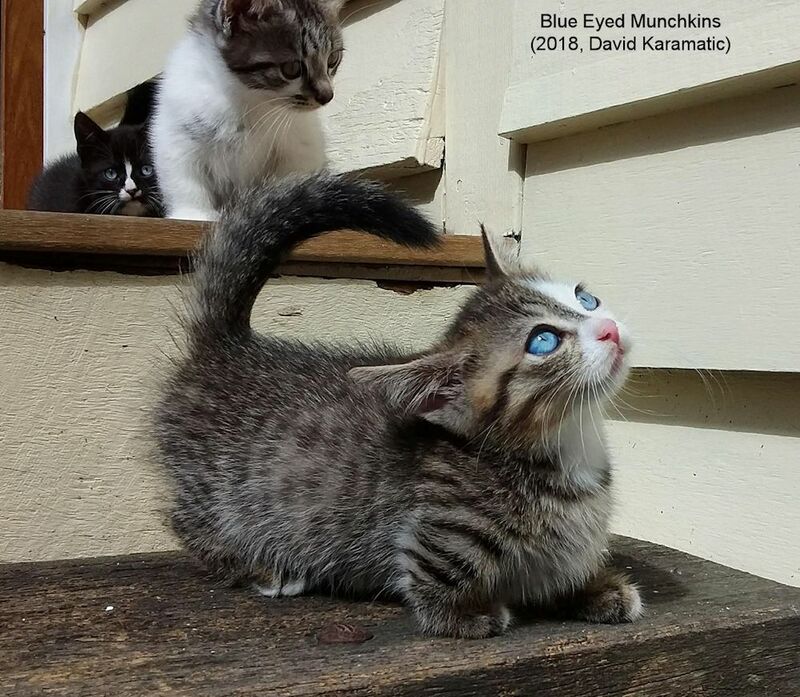 Blue eyes have been introduced into the Munchkin breed (self colours only) in Australia by David Karamatic. He imported Celestial British "Maidee" from Sophie Guittonneau and is the first of that gene in Australia. David Karamatic is working with a dominant blue eyed mutation discovered in tropical north Queensland, Australia. He was notified of some “free to good home” kittens that had retained their blue eyes. There were four in the litter three with blue eyes and one odd eyed. At first he thought it was the influence of white-spotting, but the odd eyed kitten was nearly completely black. He obtained the last kitten available, and at seven months old its eye colour is very deep and vivid almost violet. 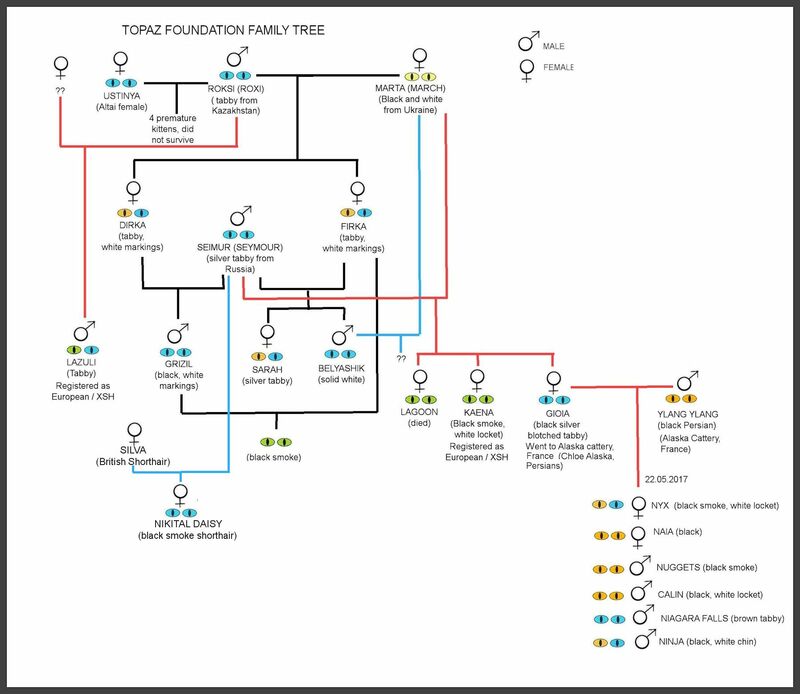 It would be interesting to see if this gene is the same as the Celestial / Topaz or perhaps on the same locus. 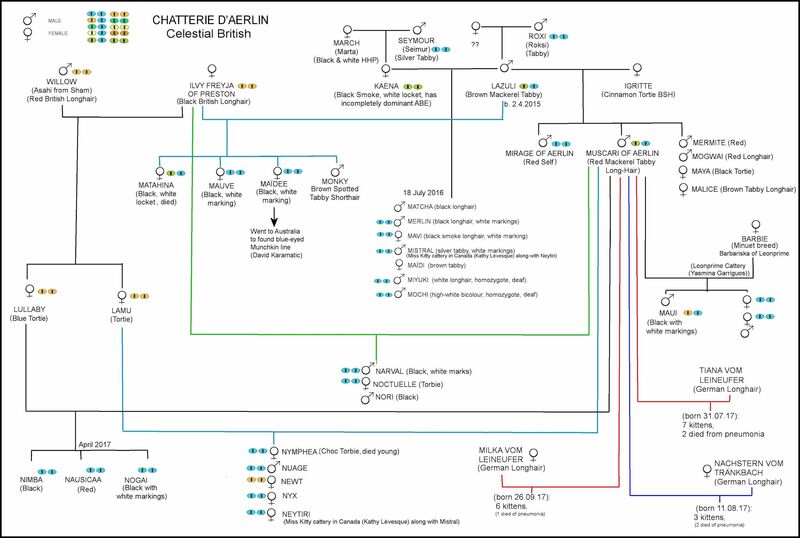 David first wants to find out if the mutation is the same as his imported French Celestial (Maidee, from Chatterie d’Aerlin), and he is also submitting samples for DNA tests. Blue eyed kittens sometimes occur in Burmilla (derived from Burmese x Chinchilla ancestors) lines with browns and chocolates in the pedigree. Although they don’t match the breed standard (green eyes), they were usually the first kittens to be sold. The blue eyes likely trace to a Himalayan ancestor many generations ago. DNA tests have identified the colourpoint (Siamese) gene in some Burmillas. In the 1980s, Himalayans/Colourpoint Persians and Chinchillas were crossed to produce the lynx and smoke point series Himalayans/Colourpoint Persians. 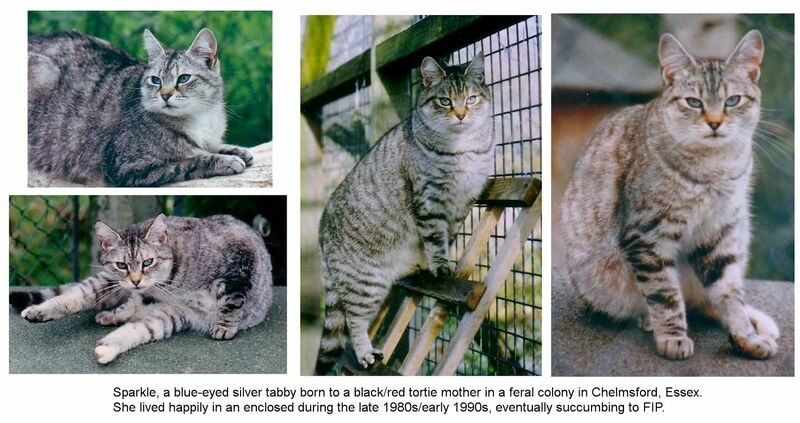 Genetically chocolate cats (and chocolate carriers) were used in the breeding programmes and some Chocolate Chinchillas/Goldens were registered without stating they were chocolate. Aquamarine eyes have also been seen in Burmillas, where the Burmese sepia gene meets up with the colourpoint gene. Because many breeders breed for light coat colour without markings, aquamarine eyes (linked to mink colour) are less important than clear silver. This also means that Burmillas have become lighter in colour than the original British cats. DNA testing on some Burmilla lines also identified the white gloving gene is present although it is not visibly expressed. The blue-eyed trait turns up surprisingly often in random-breeding cats. A grey bicolour (tuxedo pattern) cat with intense sapphire blue eyes was found on a country road in Windellama, New South Wales, Australia by A M Schnieder. Since the Ojos Azules has not been imported into Australia, this represents a spontaneous mutation among the feral population. Whether it is the same as the American Ojos Azules mutation is not known. 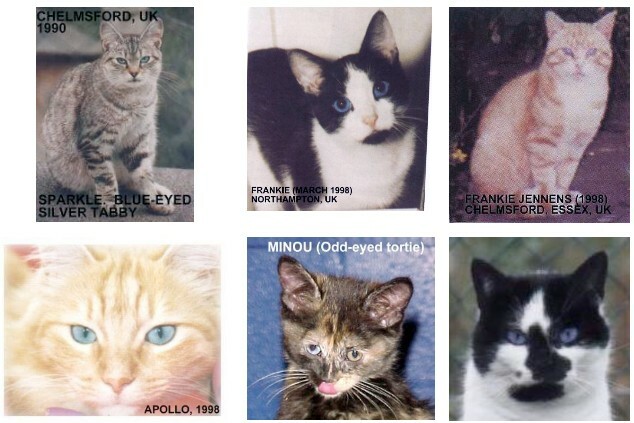 Below: silver tabby female feral cat, black-and-white male, red tabby (with white bib) male, red tabby longhair male, odd-eyed tortie, black-and-white male. Wain Harding, Secretary Egyptian Mau Breeders & Fanciers Association (May 1971 Cats Magazine): “I was very interested in your recent article ‘The Cat That Couldn’t Be Bred’ by Mrs. Sayer. The Egyptian Mau breeders have recently had four blue-eyed kittens from different parents. These kittens are beautiful well spotted, silver Mau with deep blue eyes. All of these kittens share a common grand or great-grand parent (Kattiwyckes Gulliver x Kattiwyckes Trinket owned by Mrs. Ann Cahill). The first of these blue-eyed beauties appeared in one of my own litters (Kattiwyckes Umm Usada bred to her son Bast’s Zosser). I kept waiting for this kittens eyes to change as it is often four months before a Mau kitten’s eyes change from blue to the desired gold. I exhibited Chui Chali at the Fall Baltimore CFA show when he was six months old. I still insisted that his eyes would change to the admiring public. The kitten’s eyes never changed and he grew up and sired a litter now nine days old. We are anxiously waiting for the kittens to mature. There are various known and unknown genes involved in white spotting and in blue-eyes. In solid white and high white cats there is a link to deafness because melanin is involved in the development of the inner ear (the part that detects sound vibrations). BAER testing (acoustically evoked brain stem responses) is used by many European breeders to ensure that they don't deliberately breed deaf cats. The prevalence of deafness and partial hearing in an experimental colony of white cats was 67% (deaf - 0.55 coefficient of heritability) and 29% (partial hearing - 0.75 coefficient of heritability) which suggests a pleiotropic major gene (a gene that has 2 seemingly unrelated traits) and the likelihood of polygenes. Geigy CA, Heid S, Steffen F, Danielson K, Jaggy A, Gaillard C (2007). "Does a pleiotropic gene explain deafness and blue irises in white cats?". Veterinary Journal. 173 (3): 548–553. PMID 16956778. 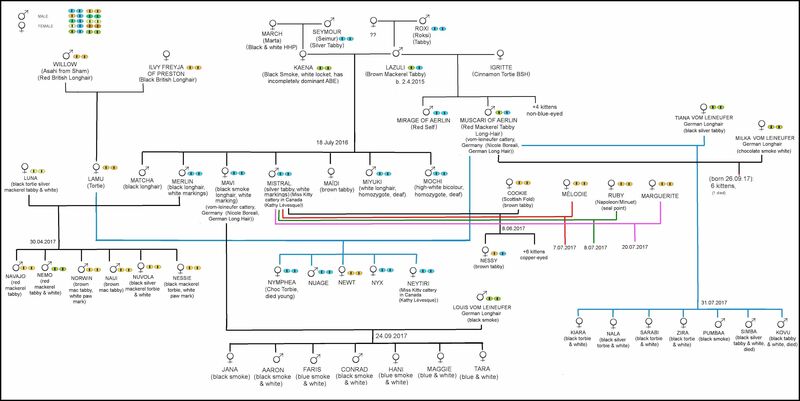 This was commented upon by Strain GM, in "Deafness in blue-eyed white cats: the uphill road to solving polygenic disorders. "Vet J. 2007 May;173(3):471-2. Epub 2007 Feb 21.